EUGENE, Ore. (AP) _ Toxic blue-green algae blooms can travel through rivers and all the way to the ocean, Oregon State University researchers say — and that phenomenon could possibly explain mysterious otter deaths in California. Algae blooms typically occur in still water like lakes and reservoirs, especially in hot weather, OSU researcher Timothy Otten told the Register-Guard of Eugene (http://bit.ly/1J4nWuL ). As a result, most people don’t think of the blooms surviving in running water. “Even in flowing rivers, you can’t assume that cyanobacteria aren’t going to be there because they may be passing through,” Otten said, using another name for the toxin-producing microorganism. Scientists at OSU used genetic tracking tools to follow the sometimes-toxic algae as it travelled 180 miles from an Oregon mountain reservoir to where the river flows into the sea. They found that the toxins can survive passing through hydroelectric turbines and hundreds of miles of river. That causes problems when the algae reach estuaries. Freshwater mussels filter the water and can accumulate more than 100 times the toxin than would be found in nearby water samples. The mussels are often consumed by mammals, including sea otters in California’s Morro Bay. Researchers there had been puzzled when they noticed that the otters began dying of a freshwater toxin, microcystin, two years ago. Microcystin is the same toxin OSU scientists found in Oregon rivers. They were able to track the toxin upstream more than 2 miles to Pinto Lake, a location notorious for periodic blue-green blooms. “You can have enough toxin in a shellfish that it’s a health concern,” Otten said, adding that the Yurok and Karuk tribes harvest the mussels downriver. Oregon’s Department of Agriculture does not test for the kind of cyano¡bacteria that grows in a lake, Otten said. “They aren’t looking for freshwater toxins in the shellfish. That’s one of the concerns,” he said. 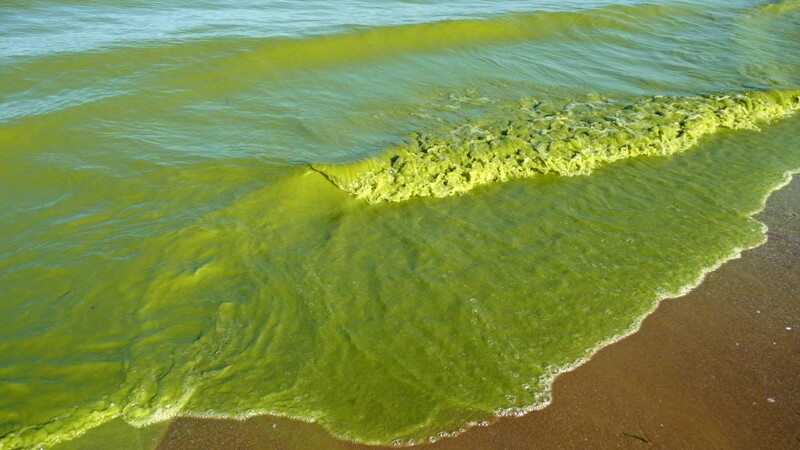 The frequency and duration of blue-green algae blooms appear to be increasing, according to Otten and OSU professor Theo Dreher. They believe a number of factors are contributing, including rising temperatures, atmospheric carbon dioxide concentrations, extreme weather and increased runoff of nutrients from urban and agricultural lands. 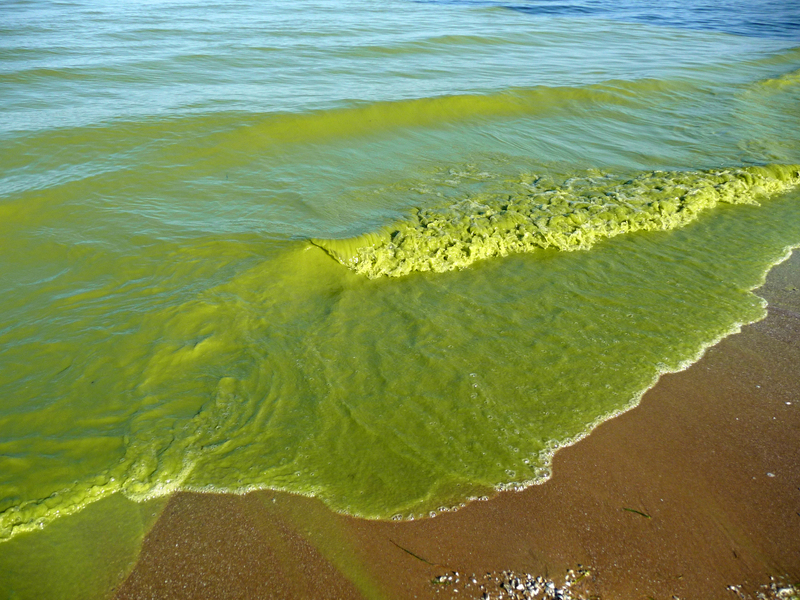 About one-third of U.S. lakes larger than 10 acres contain the toxin-producing cyanobacteria. “Behind a lot of reservoirs all over the world, this is a big problem,” Otten said. They are common in Lane County reservoirs, which are drained by the Willamette River, Row River and Long Tom River. The water then flows north in the Willamette to Portland. Swimming in water with the toxic blooms can cause brain and liver damage, rashes and gastrointestinal illness. “On a lake or river, if you see a green band along the shore or green scum on the surface, the water may not be safe to recreate in,” Otten said. In May, the U.S. Army Corps of Engineers announced it would no longer test algae blooms at the reservoirs it manages, including at the popular Lane County reservoirs. Scientists are now employing cheaper, faster and more comprehensive tests to identify the potential toxicity in a bloom by measuring its genetic content, Otten said. “You can bury your head in the sand and say, `We’re not going to worry about it, or you can try to characterize the risk,’?” he said.